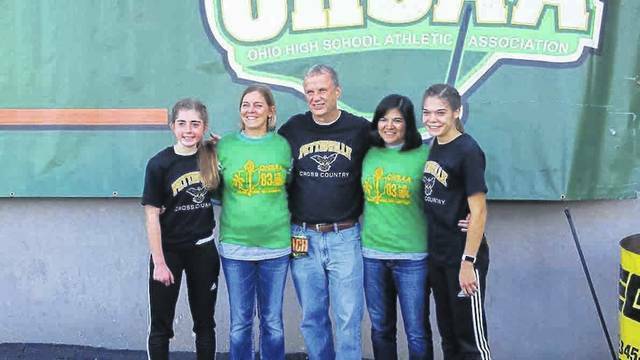 Pettisville cross country and track and field coach Tom Wagner with four of his athletes, past and present, at the OHSAA State Track and Field Championships earlier this month. Wagner stepped down after the school year. From left: Kate Stuber, Lori (Nofziger) Stuber, Wagner, Ezzie (Avina) Sauder, Elizabeth Sauder. What he thought might be a bridge to a different job, as it turned out, became something more for the recently retired teacher and coach at Pettisville Schools, Tom Wagner. The longtime mentor, who served as head track and field coach for 37 years and cross country coach for 36, and was also a teacher at Pettisville Elementary School, stepped down after the school year. It was a quick 37 years according to Wagner. Pettisville was his first job after graduating from the University of Toledo in 1981. Beginning in 1981-82, he assisted with cross country in the fall of 1981 at Pettisville and took over the track and field program during the winter of 1982. At the time he was not sure how long he would stay, but the community support sold him. Wagner, 64, who grew up in Swanton, was the seventh of nine kids in a Catholic family. He graduated from Swanton High School in 1972. After graduation he served one term on the school board at his alma mater. While at UT, he worked from 60 to 80 hours a week at Toledo Machining in Perrysburg. It helped pay for his schooling so he was debt free upon graduation in 1981. It was at that point that he moved to Pettisville with his wife. A lot of things happened during Wagner’s 37 years, however, some stick out more than others. One lasting memory is the boys track state championship team in 1991, led by the one-man team of Lincoln Cobb. After the Blackbirds took third in 1990, Cobb scored wins in the 100 meter dash and the long jump, and finished runner-up in the 200m to lead them to the title a year later. “Well Lincoln was just an incredible athlete who practically coached himself,” said Wagner. “He exceeded when he got into competition. Most kids don’t. Most kids do wonderful in practice and you’re (thinking), I wish they could do that in a meet. In the late 90s, Wagner coached a boy by the name of Doug Nafziger who suffered from diabetes. Although described as being more like a guard in football as opposed to a distance runner, Nafziger’s hard work overcame the limitations of his physique. More recently, the Blackbirds have had success on the girls side in cross country and track. They were fourth at state in cross country in 2016 and sixth this past fall. Their girls track was regional co-champions with Archbold in 2017. Wagner’s career came full circle the past few seasons with two of the girls he had in both cross country and track. He had also coached their mothers early on in his career. Lori (Nofziger) Stuber and Ezzie (Avina) Sauder, mothers of Kate Stuber and Elizabeth Sauder, were on Pettisville’s cross country team that took third at state in 1983. In total, Wagner coached 20 Buckeye Border Conference championship teams in cross country and 19 in track. He added seven district championships in girls cross country, one in boys cross country to go along with a regional championship, plus a district championship in girls track and a regional championship last season. And it could not have come at a better place. To illustrate how caring the people there are, Wagner tells the story of moving to the house he is at now in Pettisville in the fall of 1984. Wagner has some ideas for what to do during his retirement, including travel to New England this fall to see the colorful fall foliage. He has also thought about doing some re-enacting of the Civil War with a group on the east side of Toledo. Primarily, the re-enactment of the Battle of Cold Harbor – a battle in which four of his ancestors fought. Other plans include going on an Alaskan cruise and subbing at area schools.